Much is owed to Michael Pietsch, the long-time editor of David Foster Wallace, who out of the boxes of manuscripts, character sketches, notes and errata has crafted a coherent and forceful novel worthy of its departed author. In his preface, Pietsch defends the project on the grounds that the reader is better served by a book in hand, even if incomplete and unpolished, than relegating the material to academic study and obscurity. After six hundred pages, he is vindicated, and we are left grateful to him for his efforts. There is something profoundly sad about this novel, notwithstanding its inherent tragic elements; the effect is something akin to receiving a letter from a dead friend or parent, re-opening old wounds with fresh reminders of the magnitude of the loss we suffered on September 12th, 2008, when David Foster Wallace took his own life. 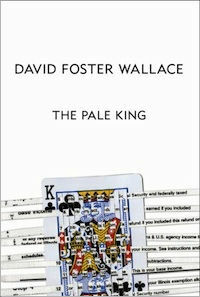 In many ways, The Pale King is Wallace’s most autobiographical novel. Devotees of the man will recognize in its many characters attributes of the writer, from overactive sweat glands, crushing insecurity and carbuncular facial disfigurement to what is perhaps his works’ most salient theme: the quest for authentic love and recognition – of others as much as of one’s self – untainted by solipsism or ego, and an exploration of the many ways in which we make this most basic of needs difficult or impossible to attain. He accomplishes this with a characteristic mix of levity and tragedy, finding humor in the most sombre of scenes and situations without also robbing them of force and gravity. Set in an IRS training facility in Peoria, Illinois, the novel is a mosaic of character studies, each one examining a different IRS employee and attempting to isolate or distill those life experiences that led them to take positions of what Wallace is careful to describe as soul-crushing boredom on a level almost unfathomable to his average reader, replete with number crunching, repetitive tasks and rote memorization of bureaucratic details so inane and inconsequential as to be worthy of Mark Twain’s condemnation of the Book of Mormon: “Chloroform in print.” His stated goal is to remove the noise with which we pollute our lives – the television shows, ambient music, drugs and alcohol – and give us the pure, unadulterated “terror of silence,” the terror of confronting our fear and inadequacy without bromide or anesthesia. It is, according to Wallace, the ability to confront this terror that creates meaning and value: “True heroism is a priori incompatible with audience or applause or even the bare notice of the common run of man. In fact…the less conventionally heroic or exciting or adverting or even interesting or engaging a labor appears to be, the greater its potential as an arena for actual heroism, and therefore as a denomination of joy unequaled by any you men can yet imagine.” What might at first seem counter-intuitive is, in fact, mere common sense, and of a piece with what his body of work has been so eloquently stating all along: that contrary to media and cultural depiction, mankind’s greatest glories are small, petty and unsexy, and consist less of triumph and achievement than of sacrifice, patience and endurance. Less expansive and digressive than his seminal Infinite Jest, The Pale King is no less effective, and is a worthy epitaph to the most ambitious American fiction writer of the last thirty years. Aeternum vale.